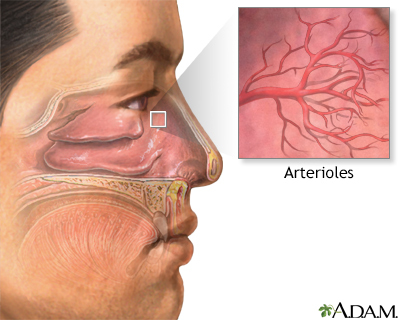 The nose is a very vascular area of the body that contains many arterioles (tiny blood vessels) that can bleed easily. Nosebleeds occur more frequently in the winter when heated indoor air can dry the membranes of the nose. Also, air moving through the nose can also dry out the membranes and can form crusts. These crusts bleed when irritated by rubbing, picking, or blowing the nose. Occasionally, nosebleeds may indicate other disorders such as bleeding disorders, high blood pressure, or hardening of the arteries.